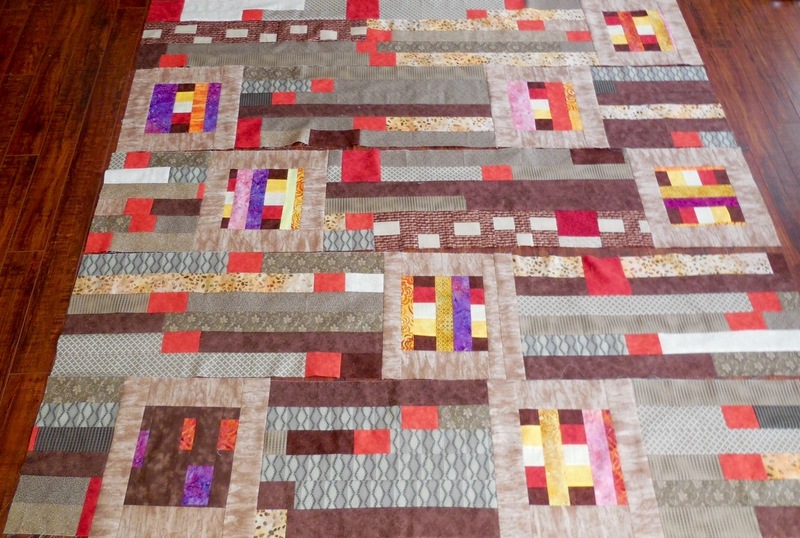 Today we have a full quilt tutorial from Melanie Rudy of Quilters… Love Color! 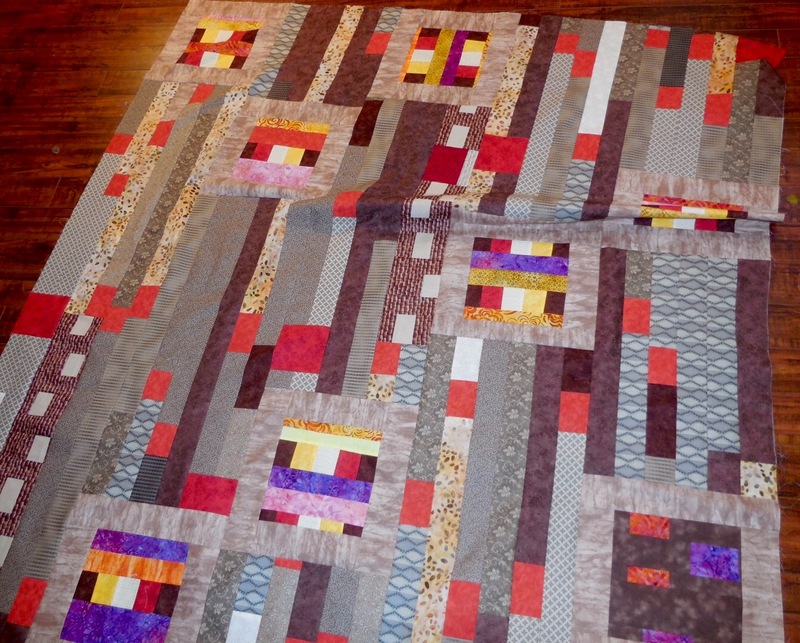 This quilt has a modern design that’s done up in gorgeous sunset tones. 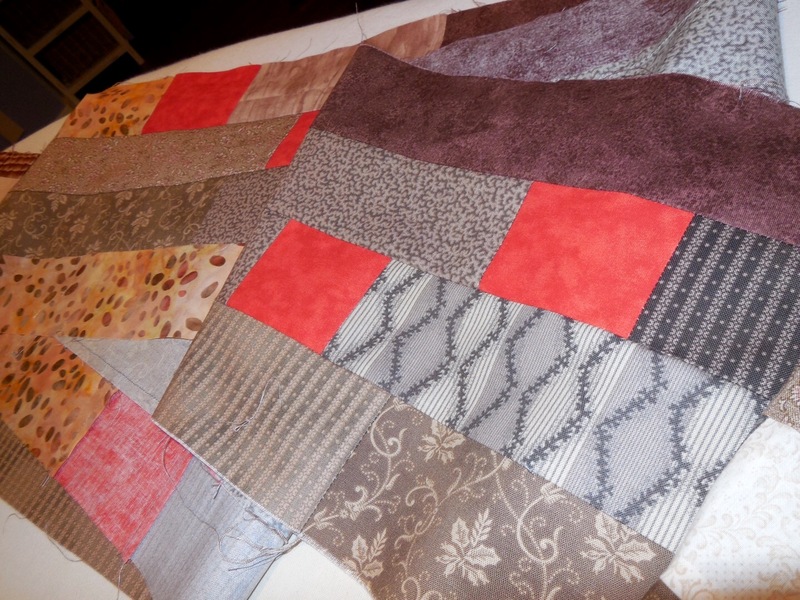 If you love this quilt, be sure to check out her blog for more great tutorials! Find a multitude of warm neutrals to combine with your bright warm colors. The warm neutrals refer to those which are related to browns. 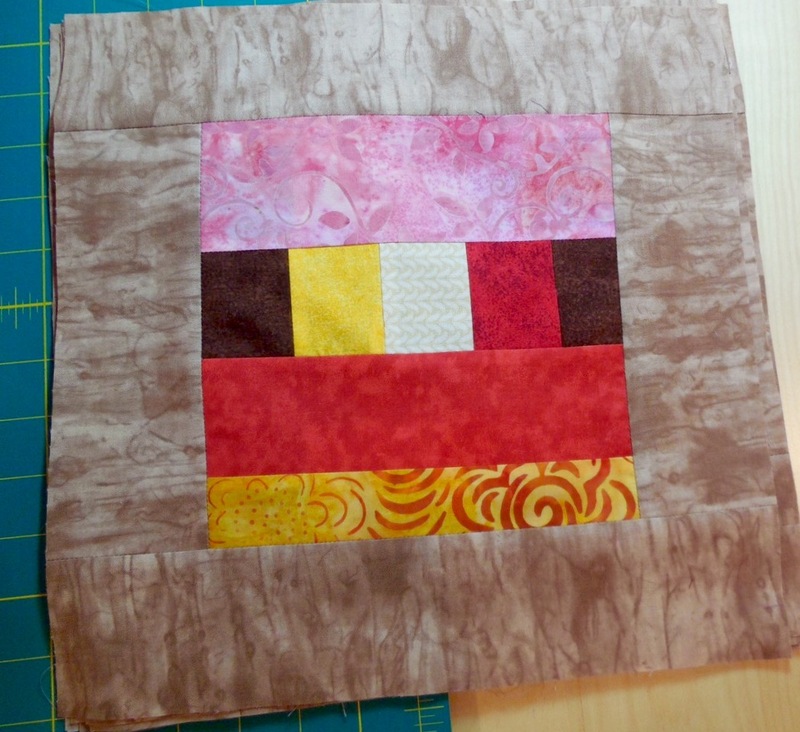 Cut the tacky warm colored panel into 8″ squares. I now have a total of 8 blocks. As this is an improvising method, this number can vary depending on what you have. This method also works very well for left over odd blocks. Referring to the following 4 photos, select a warm neutral in a light shade as a border for your blocks. 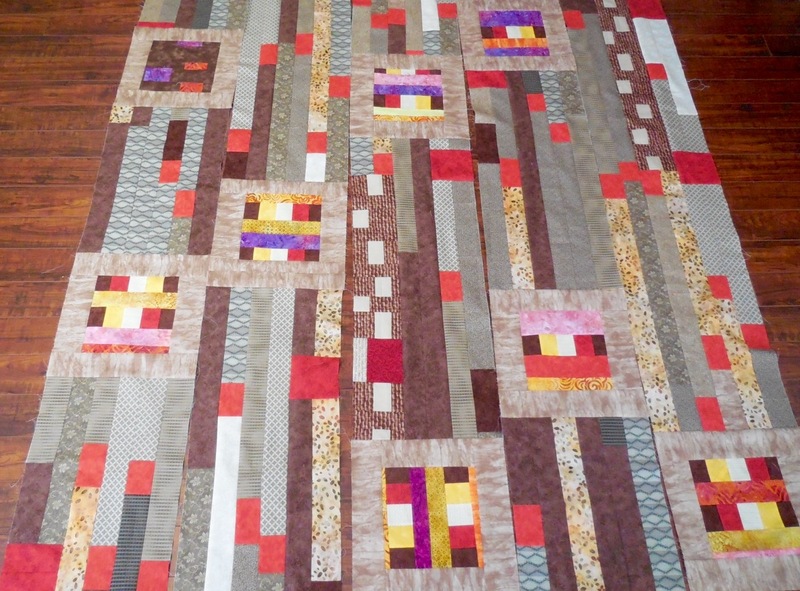 Cut one WOF 3″ strip for each of your blocks. 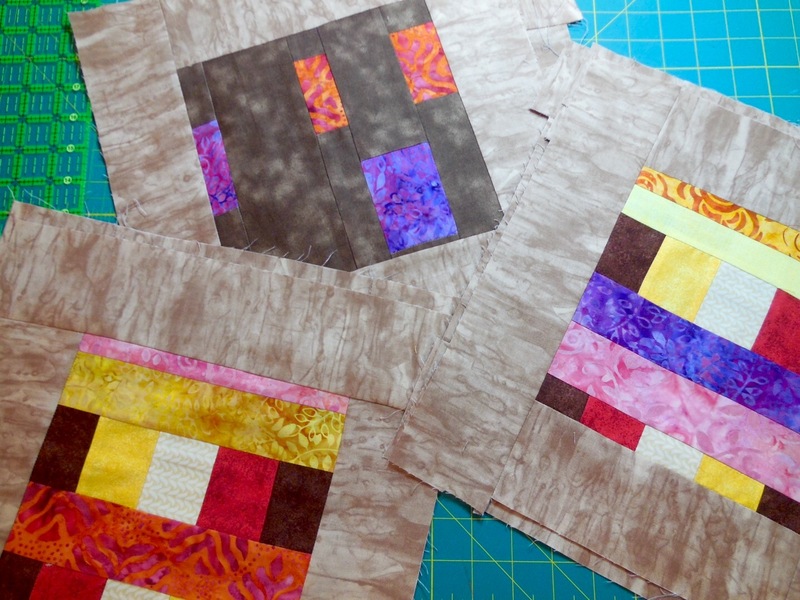 Strip piece the 3″ borders onto your 8″ blocks. 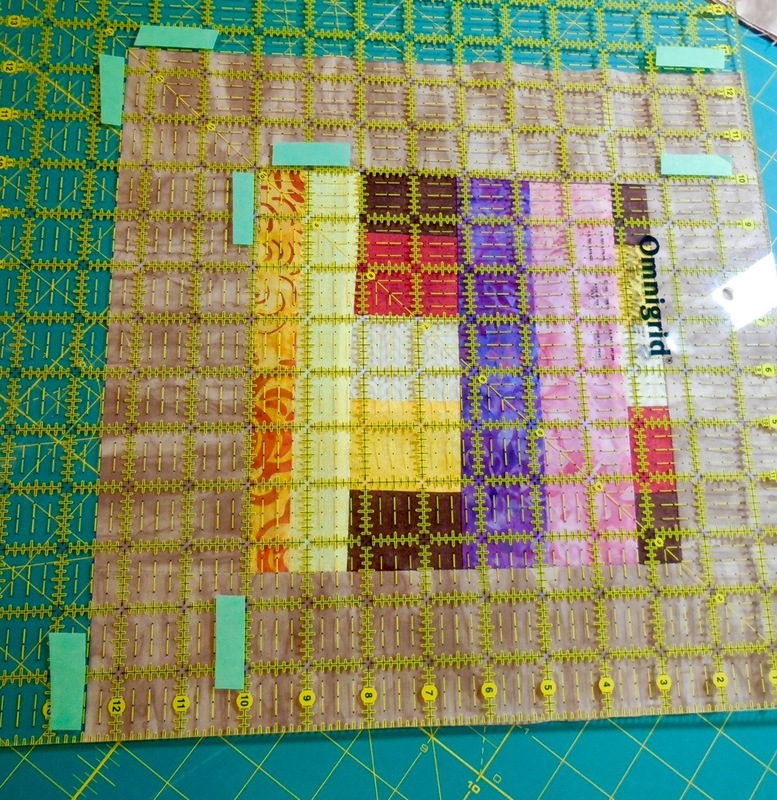 Trim the resulting block to 12 1/2″. Tape the block size on your ruler for easy reference. 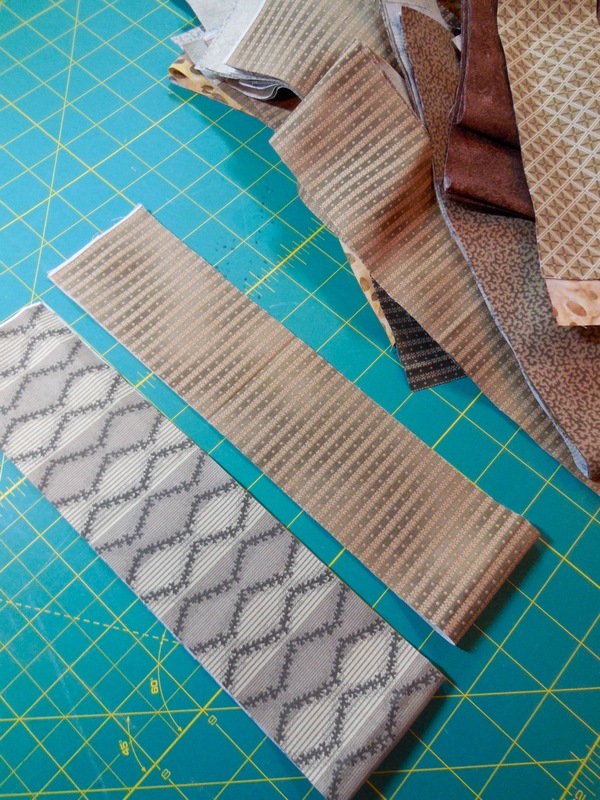 Cut your remaining warm colored neutrals into 2 1/2″ strips. 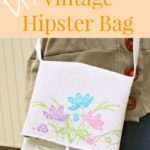 You will need an equivalent of 40 width-of-fabric strips. 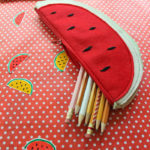 Tip: Cut striped fabric perpendicular to avoid crooked stripes. Cut approximately 24 – 2 1/2″ short red blocks to use as an accent. These can be 3″ or 4″ long. 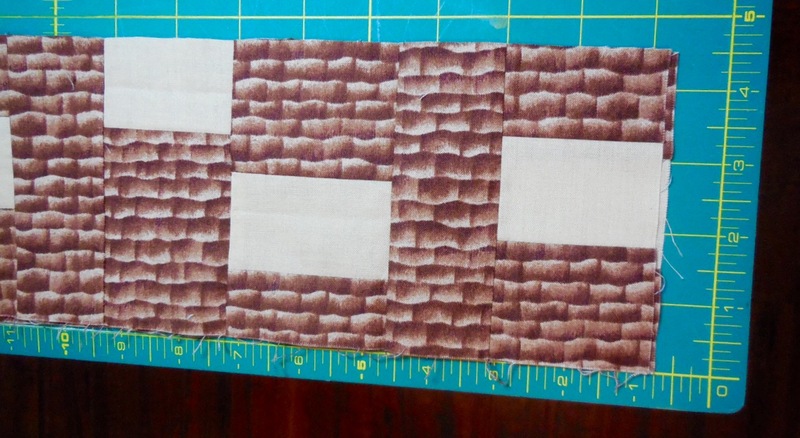 I also had a wavy border left from a previous project that I trimmed to 4 1/2″ wide to also use as an accent. Cut 5 – 4 1/2″ red (or any warm color) blocks to add as an accent. 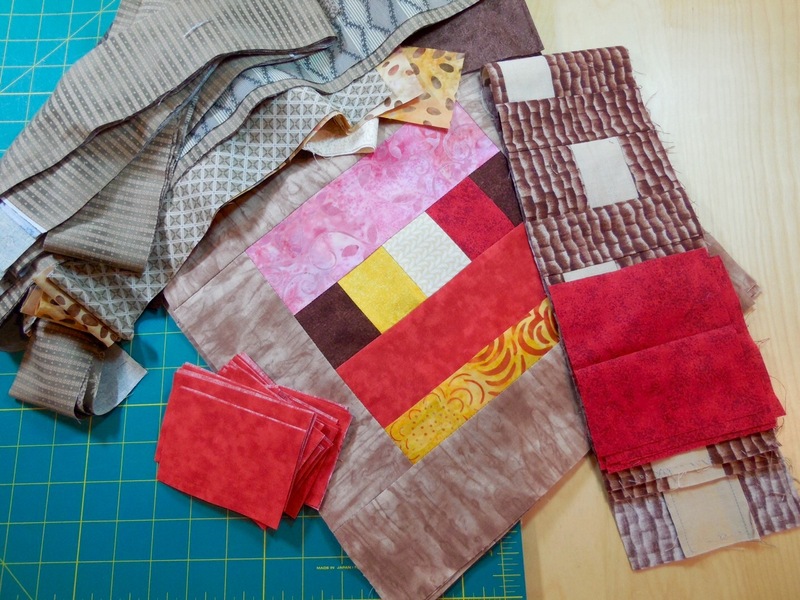 Using this 2 1/2″ Strip Quilting Method, your warm colored neutrals, and your red blocks, make your setting background strips. 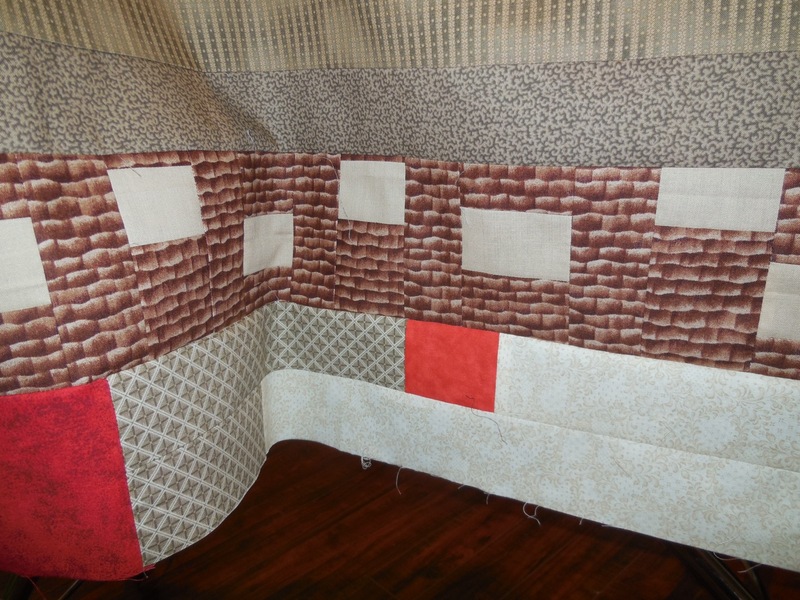 It took about 40 WOF (width of fabric) strips to have enough for my background. 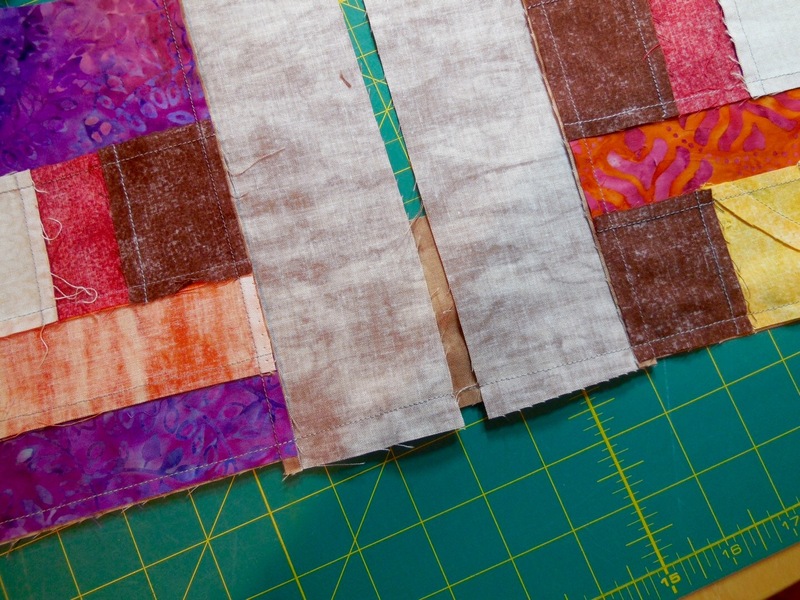 As you join your strips end to end, alternate a long strip with a 2 1/2″ red block. 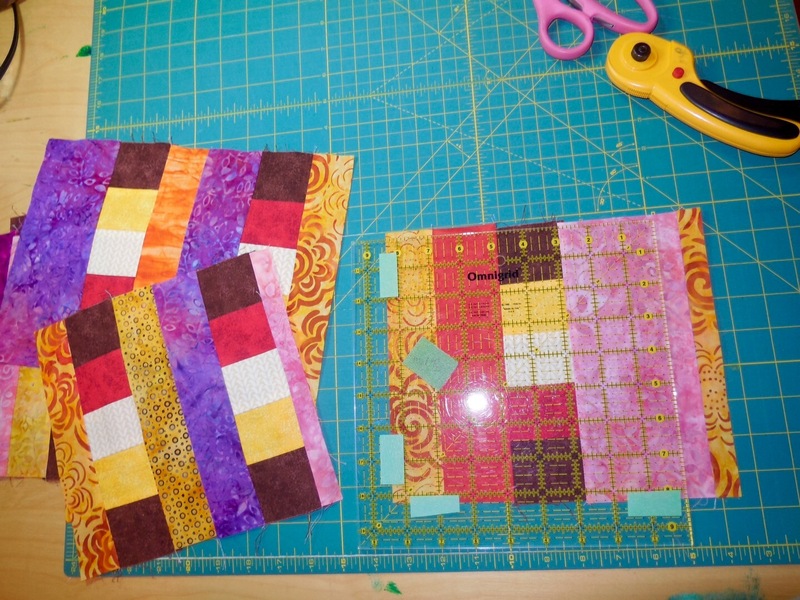 Setting in these small red blocks will bring color continuity to your quilt. It is perfectly fine if you do not have enough red blocks to go in between every strip. 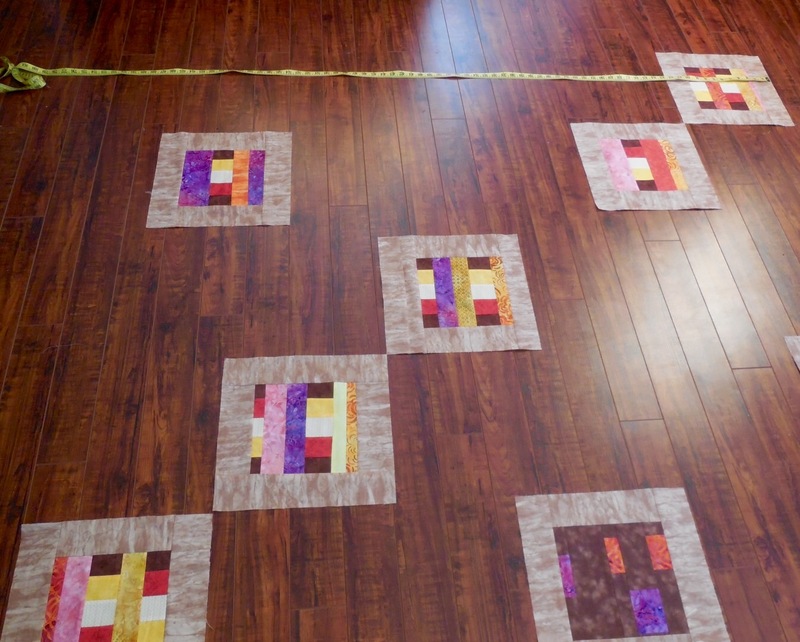 Once you have 2 long lengths of strips sewn together side-by-side (now 4 1/2″ wide), cut this into 6 equal lengths. 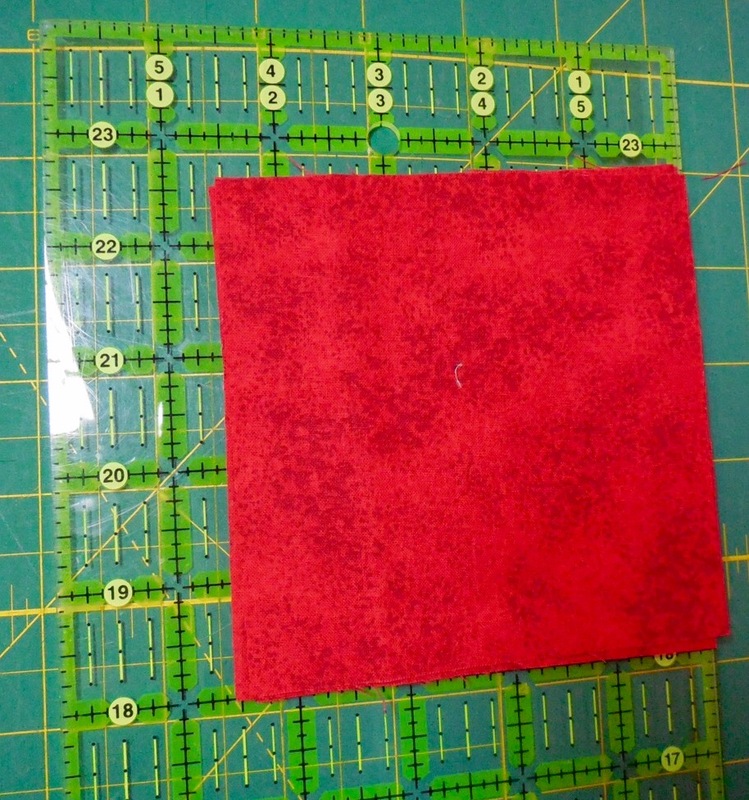 Sew in your 4 1/2″ red blocks as in this photo. This is also the point in which I inserted my left over wavy border. Now divide this long length into 3 equal sections. 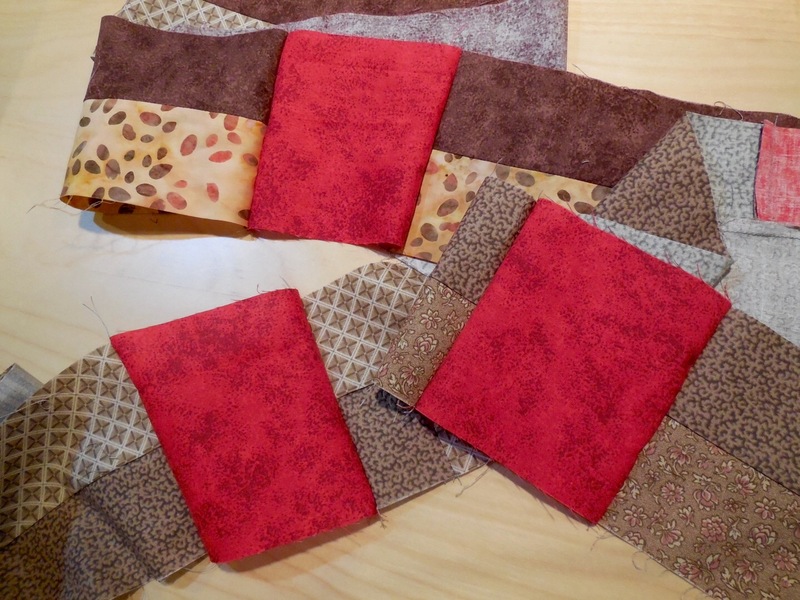 Sew these together side-by-side, resulting in 6 strips sewn together to 12 1/2″ wide. 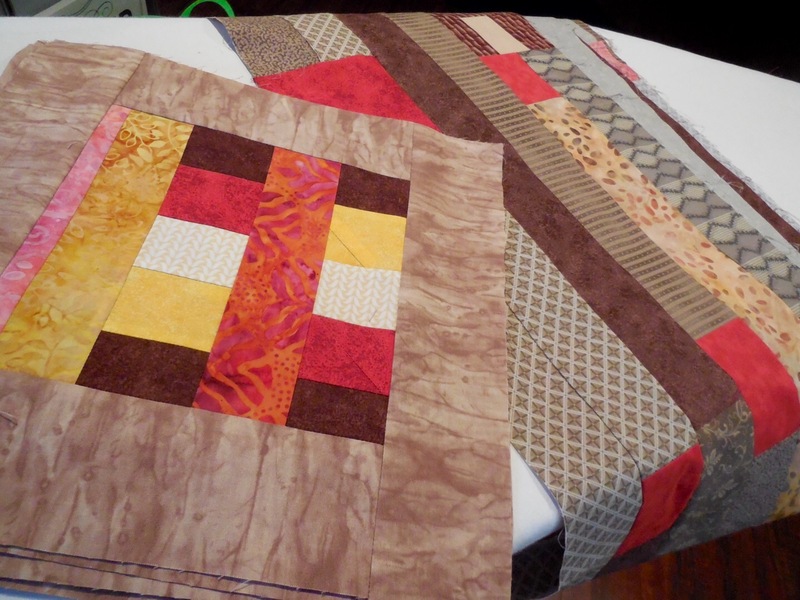 Your strip sets and blocks are now ready for the design board (or floor in my case). Lay out your odd blocks in a pleasing pattern, imagining your strips in between. 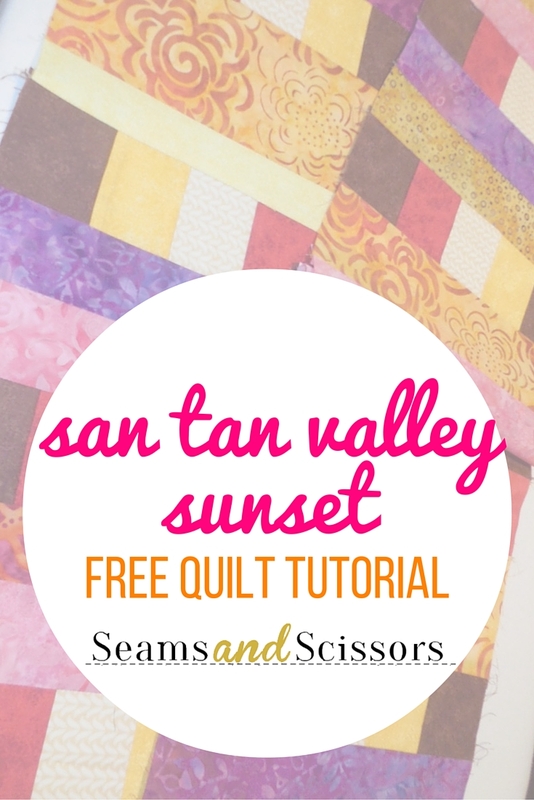 Keep in mind the finished quilt size that you desire when you do this. 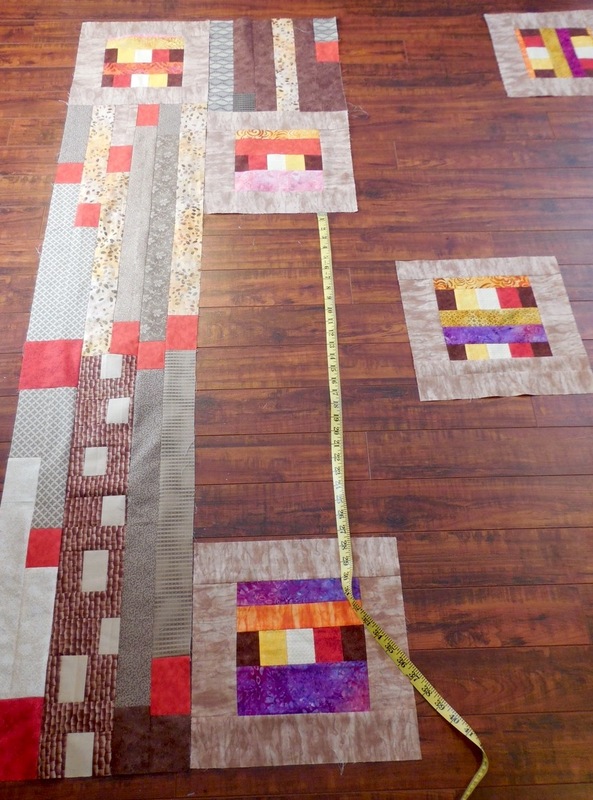 This quilt top is 60″ W x 66″ L.
Measure the length in between your blocks. 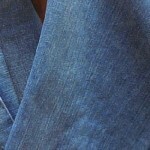 Cut the 6-strip sets to this desired length, adding 1/2″ for your seam allowance. 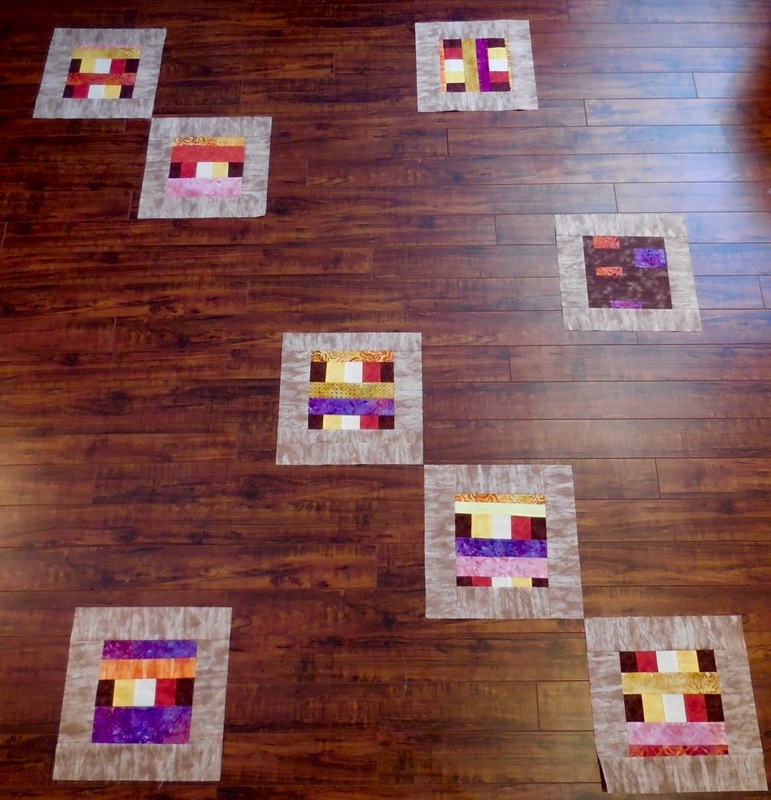 Sew the 6-strip sets in between your blocks and continue with this process until you have enough for your quilt top. Lay your strips out, rearranging if you desire. It helps to look vertically and horizontally. I am liking this horizontal layout. As this quilt developed the beautiful colors reminded me of the desert and gorgeous sunsets in the San Tan Valley of Arizona. Remember the tacky panel from the beginning? I absolutely love the transformation using this neutral color method. I hope you do too! 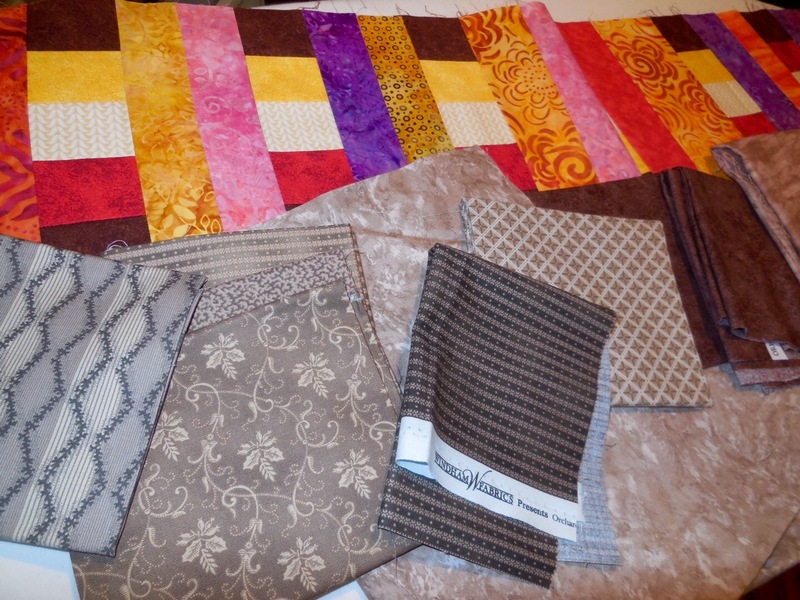 Do you prefer bright or neutral quilts?